And meanwhile, I discover the loss of a military pen pal who took his final leave five years ago. PAWLEYS ISLAND, S.C. — Ecclesiastes tells us that there’s a time to mourn and a time to dance, but lately I can hardly find time to mourn – and I’m dancing as fast as I can. 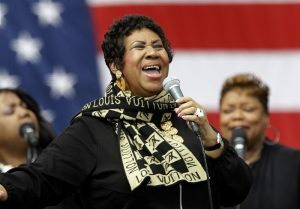 Aretha Franklin performs in Detroit in 2011. These thoughts came tumbling down Thursday after the heart-wrenching news that Aretha Franklin had died. I spent the day re-listening to all my favorite recordings of the Queen of Soul singing her heart out. When, I wondered, had I stopped listening to the one-and-only Aretha? I have loved that woman since I was in high school and spent summers here. “Beach Week” on this storied island, where the marsh marks time with the moon and spirits roam the beach, was set to the music of the ’60s – and still is. Aretha’s version of Otis Redding’s “Respect” was released as a single in April 1967, the spring of my sophomore year, when my brother was deployed in Vietnam. Those were times of upheaval, marked by the civil rights movement, women’s lib and a war only a few professed to understand. Through it all, Aretha was there, suggesting that we were all soul brothers and sisters – and that each of us deserved a little more R-E-S-P-E-C-T. You couldn’t then – and you can’t now – watch her perform that song and not feel like jumping to your feet, setting yours arms squarely on your hips and testing your body’s resistance to gravity. She was magnetic, magical and spiritual all at once, and you could feel her soul just rolling out to greet and carry you wherever you needed to go. Short and pithy was the way Col. Wm. Dougald MacMillan IV kept things. Maybe military training and his several combat deployments contributed to this quality. Or, maybe, he knew he stood a better chance of being read by making it easy. All I had to do was flip it over. No wonder I liked the guy. I don’t remember what “p.m.” meant in this context, but given that he lived in Fayetteville, North Carolina – and knew that I was an I-95 road demon who commuted between South Carolina and Washington – he probably figured I might break for a chat on the southbound leg. The card was dated June 10, 2008 – two months before that year’s Democratic and Republican conventions. Had it really been a decade? Then it hit me. I hadn’t heard from Whiskey Delta in a while. With my mind virtually attached to the 24/7 news cycle, it’s easy to lose track of time. But 10 years? How could it be? Curious, I searched his name on the internet and found what I’d hoped I wouldn’t – Whiskey Delta’s obituary. My pen pal had died five years ago. Somewhat oddly, the news sank me low. This man had written me for years and I’d only begun to learn about him five summers after his passing. He was 87 when he took his final leave. So it goes in the world we inhabit. All I know about Whiskey Delta, alas, is what I read in his obituary. Maybe one of his grandchildren will find this small meditation of interest – and be reminded that the colonel served his country with valor and briefly shared his thoughts with a humble newspaper writer he called Kilo Papa. I never did get by for that chat, Whiskey Delta, but I’ll catch you on the next round. If you bump into Aretha in the meantime, just give her a little respect – and an H-U-G – from all of us down here.